The view north from the Empire State Building provides a spectacular panaroma of Midtown and upper Manhattan. 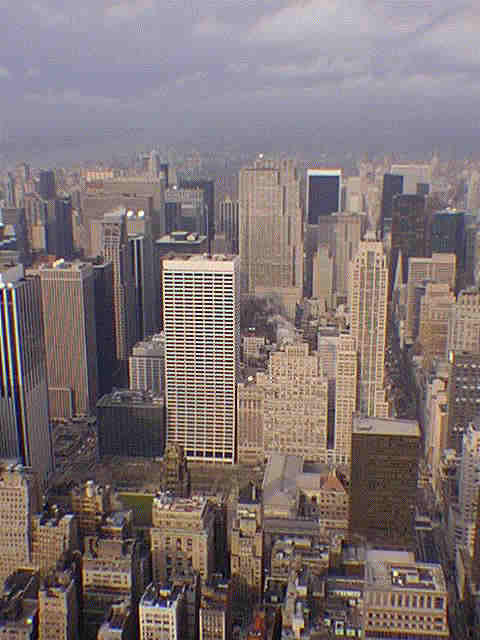 The Manhattan Schist, an early paleozoic metamorphic rock formation, forms the bedrock near the surface in the area, providing a solid foundation for all the tall buildings. Glacial features are abundant in ice-scoured outcrops throughout central park. The Grace Building (white) dominates the view, the top of the NY Public library is in the foreground in front of the Grace Building. On a clearer day Central Park is clearly visible with the forested ridge of the Palisades northward beyond the George Washington Bridge across the Hudson River.